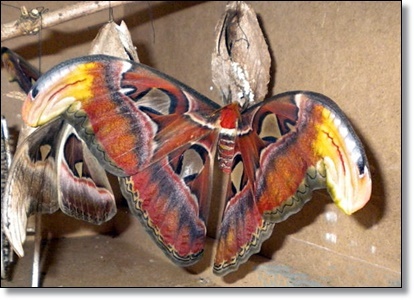 The Atlas Moth, Attacus atlas, is one of the largest species of butterfly that can be kept by insect enthusiasts. The moth is beautiful and very large, but also the caterpillars look amazing. The caterpillars are green-whitish with strange soft spines on their backs. Their last feet have a bright red spot on them. Originally this species is from Sout-East Asia. 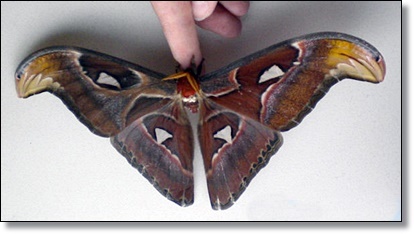 This is the caresheet for the Atlas Moth. 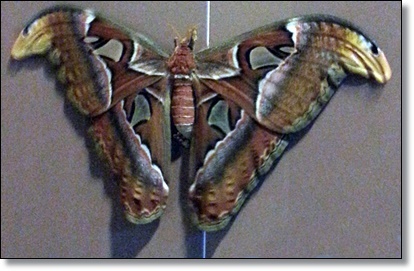 The Atlas Moth has a wing span of 25 cm. The front wings have two triangle shaped ‘windows’ made of translucent wing material, the back wings also each have a window. The wings itself are a rusty brown color, with light yellow, red, purple, black and pink accents. The caterpillars are greenish white in color with soft spines on their back. They almost look a bit powdered. On the side of the last feet the caterpillars have a red and blue spot. 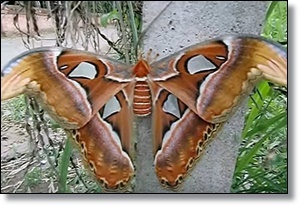 The butterflies of the Attacus atlas species do not have a mouth and therefore cannot feed. They live off the energy reserve that they obtained as a caterpillar. This means they do not live that long, generally only 5 to 7 days. The caterpillars of the Atlas Moth do eat, and a lot as well! They eat leaves of privet, Tree of Heaven (Ailanthus altissima), citrus trees, cinnamon trees and mango trees. As you can see they are not too picky regarding their food plant, but they won’t eat any leaf. 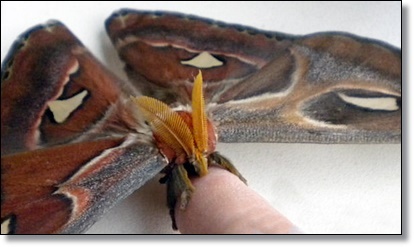 Atlas Moth caterpillars are easy pets, they do not require attention and won’t try to escape. As long as they have food, they will just eat. When they are about to make a cocoon, they will walk around to find a suitable place. During the day the moths are inactive, during the evening and night they will start to fly in search of a mate or for a suitable place to lay their eggs. During the day they are easily handled, you can pick them up by forcing them to step onto your hand or finger. NEVER grab them at their wings, because they are very fragile. A suitable housing for the caterpillars is a clear plastic box with a lot of ventilation holes. On the bottom of this container you can place paper towels. The caterpillars will live on top of their food leaves and do not need any other decoration. If you choose to place the branches with leaves in a cup of water to keep them fresh, make sure that the caterpillars cannot fall into the water. The moth should be kept in a well ventilated cage or room. This space can never be too big for them. If you use a glass terrarium or cage with wide gaps between the bars, the moths will destroy their wings when flying against the cage or the glass. Do not keep the caterpillars too moist, as humidity makes them prone to fungal infections. If you just wet the fresh leaves that you feed them before you put them in their enclosure, than it is already moist enough. When the caterpillars made their cocoons of silk and changed into pupa, you can collect them and hang them nicely. Hanging the cocoons in a planned fashion will ease the eclosion of the butterfly, opposed to having them eclose at whatever place the caterpillar has chosen. With a needle you can pin a piece of the silk of the cocoon to and hang it from the ceiling of a cage. You can also use a needle and thread and hang the cocoon from that. Try to put it as far to the edge of the cocoon as possible, so you won’t hinder the butterfly when he wants to get out. Hang the cocoons in a space with at least 30 cm free space all around the cocoons. Make sure the cage has sides that are climbable for butterflies, so they can climb up again if the accidentally fall down. The cage cannot be too big. The eggs take 10 to 14 days to hatch. The caterpillars will eat for 35 to 45 days. The pupa will develop into butterflies in around 21 days. The butterfly will live for 5 to 7 days. 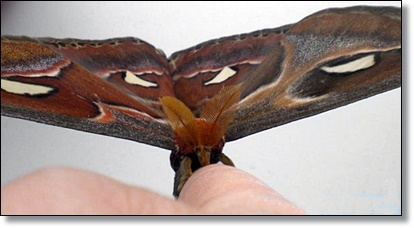 The males of the Atlas Moth are easily recognized by their broad, feathered antenna. The females have thinner antenna and have fewer feather-like hairs on them. The wings of males and females are also very different. The ‘windows’ in the wings of females are much bigger than in thewings of males. The females are a bit larger in general. Very shortly after the butterflies eclose from their cocoon, mating starts. The female will spread pheromones to attrackt a male. You do not need to do anything to make this happen. Some people say movement of air, wind, will facilitate mating because it makes it easier for the male to find the location of the pheromones. The female will produce around 200 to 300 eggs. She will also produce them if she is not mated or if the eggs are unfertilized. Do not release this moth, its eggs or the caterpillars into nature.